DES MOINES – Applications are being accepted for the 2019 Iowa Teacher of the Year. 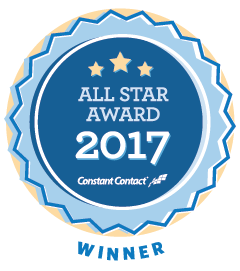 The deadline to nominate is April 27. The award is an opportunity to recognize an exceptional Iowa teacher who is helping to redefine education. Nominations will be accepted from anyone, including students, parents, school administrators, colleagues, college faculty members, and associations. The Iowa Teacher of the Year award was established in 1958. The annual program is sponsored by the Iowa Department of Education through an appropriation from the Iowa Legislature. Winners are chosen by a committee that includes representatives of the Iowa Department of Education, the Iowa State Education Association, the School Administrators of Iowa, the Parent Teachers Association, the Area Education Agencies, the Iowa Association of School Boards, the Iowa Association of Colleges for Teacher Education, and the current Iowa Teacher of the Year. The Teacher of the Year serves as an ambassador to education and as a liaison to primary and secondary schools, higher education, and organizations across the state. Aileen Sullivan of the Ames Community School District was named the 2018 Teacher of the Year. School social workers confront some of the most challenging issues facing students and their families. National School Social Work Week is always celebrated the first full week in March, and we wish to acknowledge and thank our team of dedicated school social workers! Thank you for all that you do for GPAEA and area students and families! A new, innovative cybersecurity training program offered by the SANS Institute offers young women in high school the opportunity to learn basic cybersecurity skills through a no-cost online game of discovery called Girls Go CyberStart. Participating students do not need prior cybersecurity knowledge or programming experience. All that is required is a computer and an internet connection. Young women in high school in Iowa who excel in the Girls Go CyberStart game will have the opportunity to win computers and other prizes as well as a trip, with a parent, to the 2018 Women in CyberSecurity Conference. Registration begins on January 29th and ends on February 16, 2018. The first 10,000 young women who have registered may play the game online from February 20th through 25th. Training educators to meet the academic and affective needs of twice exceptional students is a critical need in Iowa. ITAG’s spring workshop for gifted and special needs educators and administrators will assist district teams in developing plans to address these challenges and to learn instructional approaches that emphasize rigor. Teachers and all educational personnel can benefit from professional development on the characteristics and performance of twice exceptional students, which will increase the probability that these students will be identified and appropriately served with both gifted and special education services. Each team attending will leave with a district plan draft for serving twice exceptional students as well as strategies designed to provide appropriate classroom instruction. Presenters include Megan Foley-Nicpon from the University of Iowa and Rebecca Lopez and Julie MacKissock from Cherry Creek School District, Greenwood Village, Colorado. 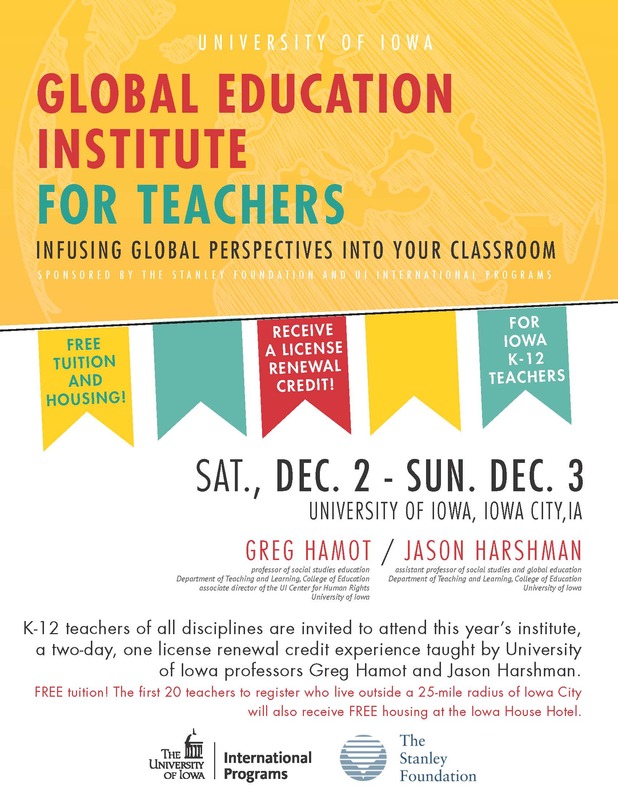 Iowa educators will share their approaches in breakout sessions. Each team attending will leave with a district plan draft for serving twice exceptional students as well as strategies designed to provide appropriate classroom instruction. Register four people from your district and ITAG will waive the registration fee for one administrator from your district! Contact info@iowatag.org for more information. Registration is limited to 200 attendees. A block of hotel rooms have been reserved at Best Western Plus, 1614 Technology Parkway, 319-277-2400, and at the AmericInn, 5818 Nordic Dr., 319-277-6166. The conference rate is $91 plus 12% tax per night. Call the hotel directly for reservations by March 12, 2018.The Best Western Plus is across the street from the Central Rivers AEA. Individuals need to cancel 48 hours in advance to avoid charges. All workshop sessions will be held at the Central Rivers AEA, 1521 Technology Pkwy, Cedar Falls, IA 50613. Ellie Hamilton, Assistive Technology Specialist, and Teresa Miller, Assistive Technology/Media Clerk from Great Prairie AEA welcomed Educators, Parents & Staff to discover new tools and resources for students and experience them hands-on on September 12 at GPAEA Ottumwa and September 19 at GPAEA Burlington. Learn more about Assistive Technology at https://www.gpaea.org/services/assistive-technology/. Lisa Jacobs demonstrating the 3D printer. Lisa created Core word symbols for Alternate Assessment using the 3D printer. Click here to view the Dynamic Learning Maps site with more instructional resources for Alternate Assessment. Did you know you can borrow an ipad with an external keyboard from the AEA Media center? The Bookshare App Read2go is reading and highlighting text on the screen above. The Dell Laptop above is connected to a Big Keys Keyboard with a keyguard. Teachers, parents, & AEA staff were able to try the switch interface pro 6 to access a Chromebook using a switch. When the switch was activated it turned the pages of a book. We used Tar Heel Reader. Tar Heel Reader is a collection of free, easy-to-read, and accessible books. Lisa Sines is trying the mouth stylus to access the bluetooth external keyboard connected to an Ipad. Join us at our annual AT Expo. Try assistive technology tools and learn about the resources available through our AEA Media Center. Thank you to everyone who attended and participated in Activities to Gain Independence at Van Allen Elementary school in Mount Pleasant presented by Kim Karwal from Easter Seals of Iowa on May 2. Do you like what you see? All of the items in the virtual tour and more are available through Easter Seals Iowa Assistive Technology Center. Easter Seals has an Assistive Technology lending library and a demonstration center. 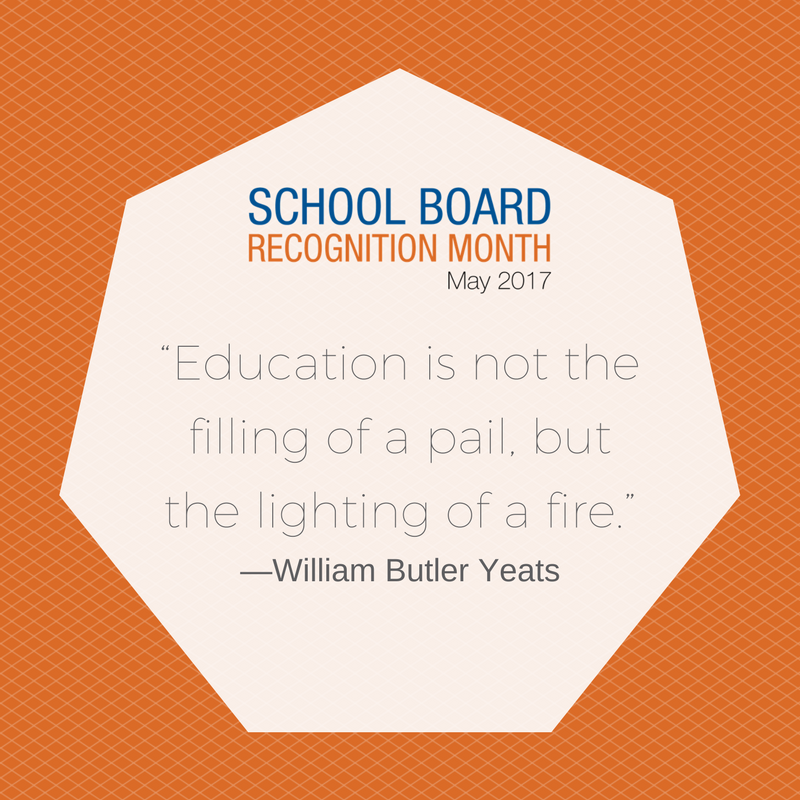 Our Agency Board of Directors and the Board members of the local school districts in our Area volunteer countless hours of their time each year to serve their communities and schools. Please consider thanking the school and AEA Board members that you know throughout our Area. 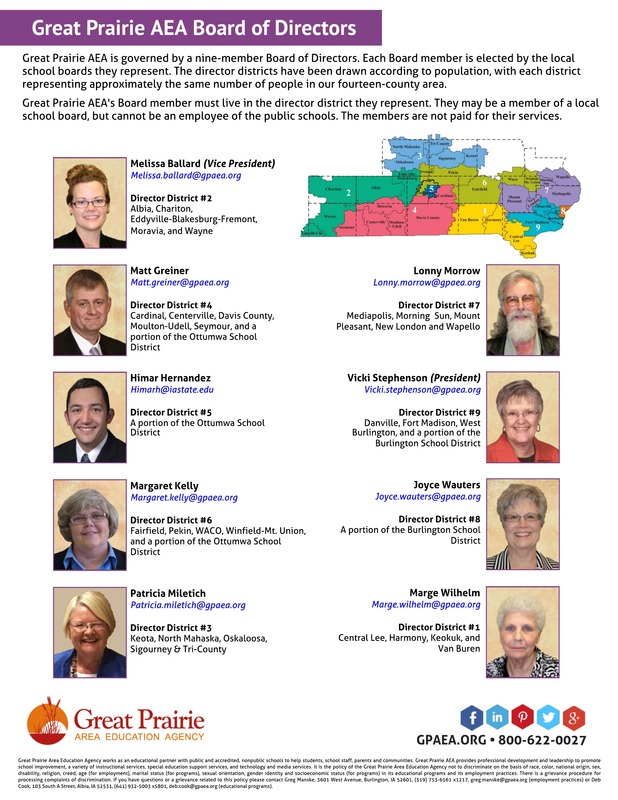 Click here to learn more about the Great Prairie AEA Board. Every year, students from southeast Iowa demonstrate high levels of achievement at state and regional STEM competitions! These competitions provide students with the opportunity to experience an authentic problem-solving situation while applying skills and concepts from multiple disciplines; science, engineering, ELA and math. For example, in a science fair project, students demonstrate and practice the ELA standards related to writing a literature review, preparing a research paper, designing the display board and orally presenting their findings to various judges and audiences. They also create spreadsheets and analyze data using algebra and statistics. All use technology to gather, organize, analyze, design, and/or present their findings. For more information contact Tami Plein at GPAEA or use the links after each section below. Congratulations to our GPAEA schools Moravia, Eddyville-Blakesburg-Fremont, and Ottumwa on their successes at the State Physics Competition at UNI on April 11! Moravia placed 5th overall in the teams. The Soda Straw Arm team of Colton R and Zane B brought home the first place medal. Zane also teamed with Tyler F and placed 3rd in the Catapult. Moravia is coached by Jewell Rockhold and her school team placed first overall in the GPAEA Regional Competition held last month. The Eddyville-Blakesburg-Fremont Mousetrap car team of Claire Jager and Haegen Boyer placed 3rd. EBF is coached by Kristen Birchard and her school team placed second overall in the regional competition. Ottumwa’s Jade Turner placed 3rd in Soda Straw Arm. Jade and Saelim Butler placed 1st in this event at the regional competition. They are coached by Theodore Westhues. Every year SE Iowa is heavily represented at these competitions. Over 200 students from Burlington, Central Lee, Danville, Fort Madison, Holy Trinity, Keota, Keokuk, Eddyville-Blakesburg-Fremont, Maharishi SAE, Pekin, Van Buren, and Winfield-Mount Union participated in these fairs, earning thousands of dollars in scholarships, trips, awards and prizes. This year seven GPAEA students representing four districts will be heading to Los Angles for the International Science and Engineering Fair (ISEF) in May! Aaron W, Central Lee High School, is one of the Eastern Iowa Science and Engineering Senior Champions. This is a regional fair held in Cedar Rapids every April. His research, “Engineered Environmental Containment: Using Lemna minor L. to Reduce Nitrate Levels in Aquatic Environments” focused on engineering an aquatic containment system that is able to contain a duckweed. He then investigated using the duckweed to reduce the nitrate and phosphate levels in aquatic environments. Aaron and his adult sponsor, Alicia Schiller-Haynes won all-expense paid trips to Los Angeles to compete at ISEF along with scholarships and awards. EISEF Junior Champions Serenity H and Claire W, Central Lee Middle School, will also travel to Los Angeles as observers along their adult sponsor, Nadine Weirather. While student observers do not present their research at the international fair, they have the opportunity to participate in hands-on STEM challenges, as well as participate in activities that help them to better communicate and expand on their research, and volunteer for the Education Outreach Program. Two Burlington High School students and their sponsor, Elizabeth S, also earned all-expense paid trips to ISEF from the State Science and Technology Fair of Iowa (SSTFI) held in Ames. Vidya M, State Champion, presented “A Novel 3-D Engineered Solution for Congenital Microtia of the Ear”. Vidya’s project involved using 3-D engineering to form an artificial ear and canal and then testing the ability of it to transmit sound using a sound probe to detect the sound. Alexandra Z(Grand Honorable Mention winner) researched how to increase the efficiency of a nasal epinephrine delivery system through the usage of pretreatments such as ethanol or propylene glycol in her project “Increasing the Efficiency of a Nasal Epinephrine Delivery System”. SSTFI also sends student observers to ISEF in Los Angeles. Joining the Iowa contingent listed above are Kamryn B, Van Buren High School (Amanda Schiller, sponsor) and Jarrod K, Keota High School (Jenny Hobbs, sponsor). Celebrate Better Hearing and Speech Month! This is a great opportunity to learn to teach coding to elementary and middle school students! This training and curriculum resources are provided by Code.org and a grant through the University of Northern Iowa. There is no cost to attend. Teachers will need to provide their own laptop. Head of School of Groves Academy, a private school for students from second through twelfth grades diagnosed with dyslexia and attention deficit disorder. Director of the Iowa Reading Research Center and an Associate Professor in the College of Education at the University of Iowa. Magnificent, Multi-sensory Activities that Make Learning Last! Mark Your Calendars for American Education Week—November 14-18, 2016!